1" squares on each side. 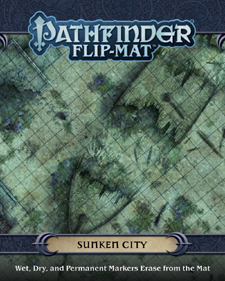 Pathfinder Flip-Mat: Sunken City features environments perfectly suited for deadly encounter deep beneath the waves! One side shows the broken fragments of a wrecked ship resting among the crumbling remains of a flooded town, while the other displays the coral-choked towers of a long-lost drowned ruin. This portable, affordable map measures 24" x 30" unfolded and 8" x 10" folded. Designed for experienced GMs and novices alike, and usable with both dry erase and wet erase markers, Pathfinder Flip-Mats fit perfectly into any Game Master's arsenal! Pathfinder Flip-Mat: Sunken City, and be ready next time your player take the plunge!